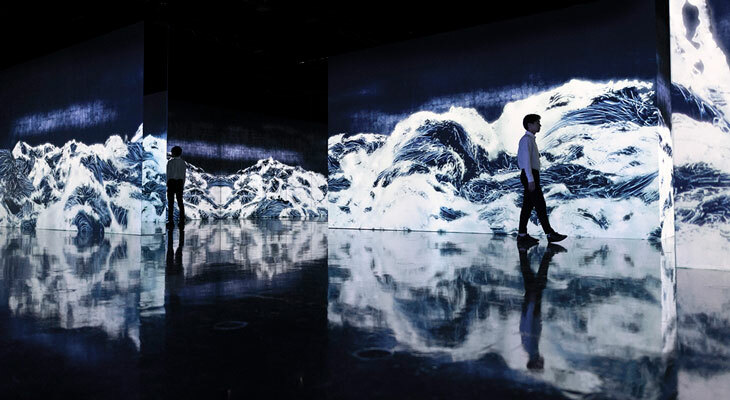 The exhibit presents three installations by teamLab, an interdisciplinary artistic collective interested in exploring a new form of relationship of human beings with nature and the world that surrounds them, through digital art. ‘teamLab’ is a multidisciplinary art collective founded by Toshiyuki Inoko in Japan in 2001; its work is developed in the field where art, science, technology, design, and the natural environment come together. Its work is based on the collaborative practice of several hundred professionals including artists, programmers, engineers, digital animation creators, mathematicians, and architects. Far removed from the traditional notion of the author signing his or her work, the collaborative work of this multidisciplinary team constitutes one of the group’s pillars for generating its sophisticated immersive spaces. Self-proclaimed as “ultra-technologists” for their use of technology as a tool for expanding our knowledge and experience, the teamLab collective seeks to expand the possibilities of art through digital technology, and to generate new ways of relating with the environment through its works. The notion that there is no separation between us and nature permeates all of its works, which seek to reduce the limits between the interior and exterior worlds with immersive environments, merging the spectator with the work. This exhibition will show how digital technology has made it possible for art to transcend physical limits. TeamLab member artists are the greatest exponent of a radically contemporary visual language and an unprecedented technological level, where the influence of ancient Japanese culture is also evident throughout its work. Far from being a paradox, tradition and innovation coexist in a totally organic manner. teamLab, ​Flutter of Butterflies Beyond Borders, Ephemeral Life born in Au-delà des limites, 2019, instalación en La Villette, Paris. © teamLab, cortesía de Pace Gallery. 1.Black Waves: Lost, Immersed, and Reborn (2016) is the installation that occupies the largest part of the exhibit. Inspired by Japanese artistic tradition, its waves bring to mind The Great Wave off Kanagawa painted by Hokusai in 1830. After calculating the interaction of thousands of particles with each other, a 3D computer-generated space expresses its movement in a large body of water that gives rise to a continuous wave. The resulting space generates an attraction in the spectator who feels submerged in the force of the waves and becomes part of a whole in the same way that the particles do. The space incorporates more than thirty projections on an area of reflective walls and floors, generating a powerful immersive effect where the visual re-creation of water, as a key element of the natural environment and life, is the protagonist. 2. Flutter of Butterflies, Born from Hands, (2019). 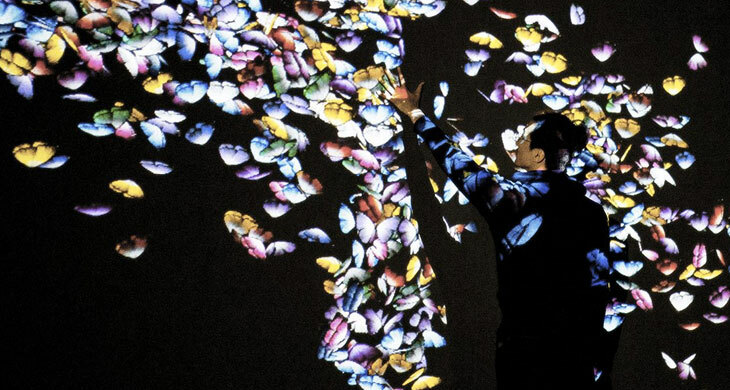 An interactive piece where butterflies emerge, swarm, and disappear through contact with the visitor. The work responds to the interaction with the public, who by touching the walls make hundreds of butterflies appear and disappear, thereby suggesting the fragile balance between human beings and nature. The work also evolves in real time, in a continuous transformation that depends on the surroundings, and that ensures that the beautiful patterns generated by the butterflies are never repeated. With this piece, teamLab transcends the physical and temporal limits of conventional art. Thanks to the masterful use of digital resources, it not only manages to present a work in permanent evolution that extends beyond the space, but also establishes a bond between the people who contemplate it, while the action of each spectator affects the result of the piece. 3. Enso – Cold Light, (2017) is a re-interpretation of the Zen practice of painting a thick-stroke circle with a single brush stroke. 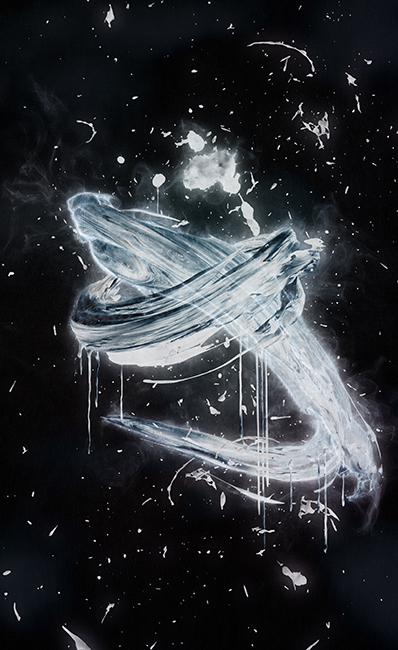 In its concern to explore the roots of Japanese culture from a contemporary language, teamLab has worked since its beginnings around traditional calligraphy, evolving it to what they call spatial calligraphy. The depth, speed, and strength that each brush stroke contains on the paper is intensified in an extraordinary way when transformed into a three-dimensional form in motion. In Zen, the Enso symbolizes enlightenment, strength, elegance, the universe, and emptiness; and the circle symbolises the moment when the mind is freed so that the body or spirit can create. By suspending the ink circle in space in such a way that the viewer can see it from different points of view, the observer feels as if they are practically merged with the stroke. The ‘teamLab’ exhibit is also accompanied by a workshops programme prepared by our educational team. There are workshops for all ages, and registration is free. See all of them here.